The use of cedarwood oil for hair loss is becoming very popular thanks to a successful alopecia areata study. 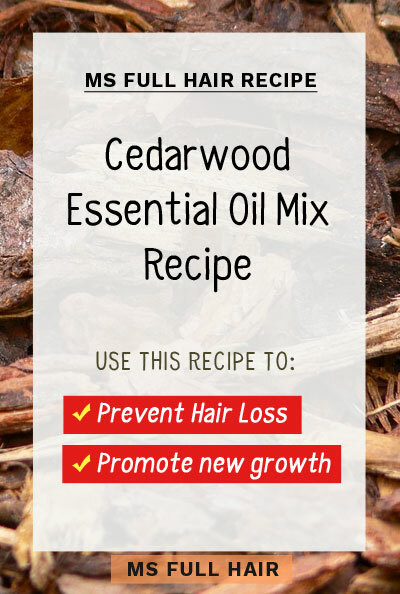 In this review, you will learn about cedarwood essential oil, its various benefits including hair, and the famous study that increased the popularity of using cedarwood oil for hair regrowth (Click here to skip to the promising results!). In addition, we also came across a few success stories of people using cedarwood oil for hair growth. Finally, we will share our top 3 recommendations and a couple of DIY cedarwood oil for hair recipes (this recipe blend is a must use) for you to try at home. Cedarwood essential oil, also known as cedar oil, has been used as a natural remedy for healing various symptoms for centuries. Extracted from various leftover parts of conifers such as bark, roots, and needles, these parts then go through a steam distillation process for pure extraction. Cedar wood has a deep and rich woody scent, making it a great oil for aromatherapy uses in relaxation and stress relief. This popular essential oil also has many other beneficial properties including antiseptic, antifungal, antispasmodic, and antiseborrheic, just to name a few. This explains its wide ranges of uses for alleviating various ailments such as arthritis, infections, acne and eczema, as well as hair growth. If you do a quick Google search on cedar oil, you’ve probably come across many different types ranging from Atlas cedar essential oil, Texas cedar oil to Himalyan cedardarwood oil. Let’s talk about what’s common first… then get into the differences between them. First, all of these different types of cedarwood oils have one thing in common: they are all from conifers –cone-bearing trees with needle leaves. Other types include Lebanese Cedar (Cedrus libani) and Cyprian Cedar (Cedrus brevifolia). What’s the best cedarwood oil for hair growth then? Which oil is good for hair? If you are looking for the best cedarwood oil for hair loss, go with Atlas Cedar, which also happens to be the most popular cedarwood essential oil of all types (Click here to see our top 3 recommendations). What are the benefits of cedarwood oil for hair loss and growth? 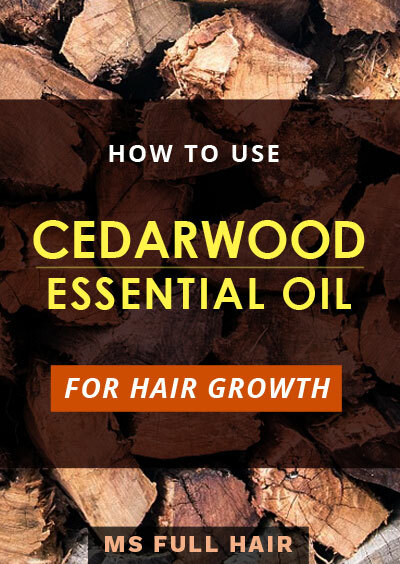 How does cedarwood help hair growth? Cedarwood oil has antiseborrheic and anti-fungal properties which reduce excessive sebum buildup on the scalp (thus preventing premature hair loss) and minimizes skin inflammation such as dandruff and folliculitis. Cedarwood essential oil also promotes increased blood circulation, which helps stimulate hair follicles when topically applied on the scalp. Cedar wood oil has antiseborrheic property, which simply means that it controls the overproduction of sebum. When sebum is over-produced, it can lead to all types of scalp inflammation issues including premature hair loss. Sebum is a natural oil produced by the sebaceous glands in the skin. Sebum plays an important role in moisturizing skin, keeping PH in balance, and assisting the skin from drying out. The issue arises when the sebaceous glands produce excess sebum. This often results in what you call “oily scalp” caused by clogged hair follicles in the pore areas. 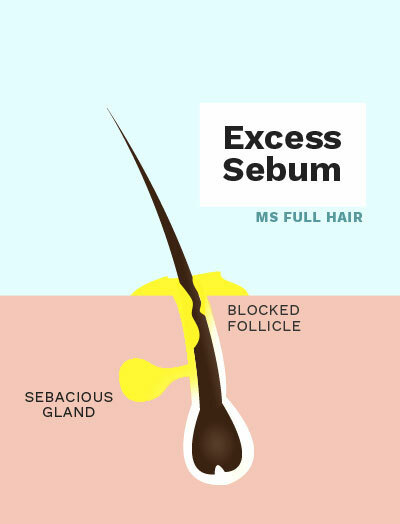 Excess sebum buildup on the scalp also interferes with the normal hair growth cycle, which can result in unwanted hair loss. You can effectively use cedarwood oil for hair loss prevention, thanks to its natural ability to regulate sebum levels. 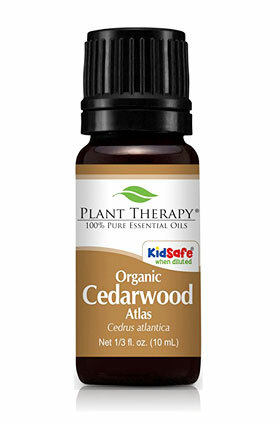 Cedarwood oil contains anti-fungal and anti-inflammatory properties. Cedarwood oil is easily absorbed through the skin. A number of studies show the benefit of using cedarwood essential oil externally on symptoms such as joint issues and menstruation regulation. When applied on the problematic areas, it helps increase blood flow. You can also use cedarwood oil to help stimulate hair follicles by increasing blood circulation to the scalp. Its easy-absorption along with antiseborrheic and anti fungal properties make cedarwood essential oil a great candidate to stop hair loss and promote hair growth. A Scottish study in 1998 (1) shows the benefit of using cedarwood oil for hair loss, specifically for alopecia areata (also known as bald patchy hair loss). There were 86 participants with alopecia areata in this study (divided into 2 groups). The first group was given the above mixture (essential oils + carrier oils) to be applied topically, while the other group (control group) was prescribed with carrier oils only (jojoba oil + grapeseed oil). 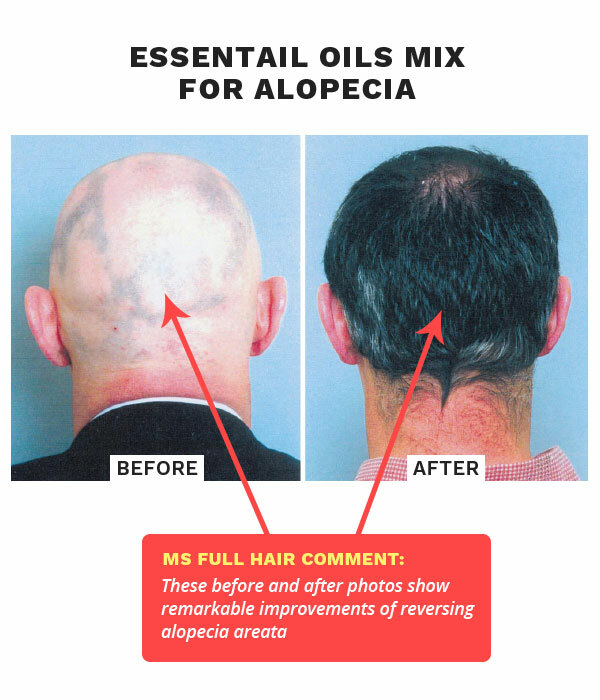 After 7 months, 44% of the first group (treated with essential oils + carrier oils) saw great improvements on reversing alopecia areata, while the other control group’s result was limited to 15%. The before photo (left) shows the shaved head. You can easily see smooth balding patches in various places. Now look at the after photo. It shows complete hair regrowth. It’s even difficult to recognize if it’s the same person. What does this result mean to people with thinning hair? The fact that 15% of the control group (Jojoba oil and grapeseed oil) saw improvement indicates that these two oils can still be used as powerful carrier oils to promote hair growth and treat hair loss. In addition to the study, we also found a number of people who have successfully used cedarwood essential oil for hair. We also came across a blog(2) that shares her before and after photos of using the above study oil mixture (cedarwood, lavender, rosemary and thyme) for her postpartum hair loss. Her before photo shows how severe her hair loss was after pregnancy, especially on the side part of her hair. The after photo shows visible new hair growth filling in the thinning spot. What’s more amazing about these before and after photos is that it only took 1 month to begin seeing results. If you are looking for the best essential oil for thinning hair, add this mixture to your list (see our Recipe #1 on how to make it at home). 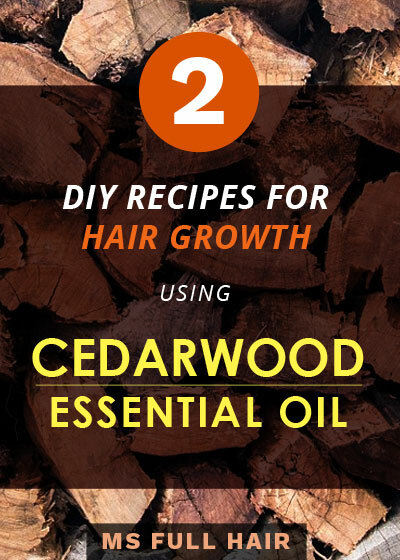 One guy from Hair Loss Talk shares his cedarwood essential oil experiment (3). He tested cedarwood oil on one side of his chin. After a couple of weeks, he clearly noticed that the area is definitely producing less sebum by witnessing dryer skin compared to the other side. This is likely due to cedarwood’s anti-seborrhoeic property, which aids regulating the production of sebum levels. A patent filed by Johnson & Johnson also proves this point (4). The document points out that cedarwood and poplar bud extract are effective in reducing sebum levels. What are the best essential oils for hair growth and thickness other than cedarwood? Consider peppermint and rosemary oil for essential oils that stimulate hair growth. For carrier oils for hair, olive oil provides multiple benefits for extending the anagen phase, preventing hair loss as well as thinning hair issues. While cedarwood essential oil is considered to be safe, there are a number of things to keep in mind. First, it’s generally not recommended to be used during pregnancy. Next, when you are planning on using cedarwood essential oil for hair loss (for topical use), make sure to dilute with a carrier oil. This will prevent any possible irritation or increased skin sensitivity. It’s also possible that you may have allergic reaction to cedar trees. The best way to find out is to do a quick patch test at home by mixing a tiny amount of essential and carrier oils together to your inner elbow. Leave it up to 24 hours to determine if there’s any skin reaction to the applied area. This is the ratio used for the alopecia study, but it only makes a tiny amount. In order to use it consistently, multiply each amount by 10 at least and store in an area without direct sunlight. Apply the oil mix every night for at least 3 months to see the results. Do you like to add every possible essential oil to stimulate hair growth? Use this hair regrowth recipe, which we added a couple of more oils to the study formula. Apply the oil mix to the scalp every day for at least 3 months to see the results. Where to buy cedar oil for hair? If you are looking for variety of options to choose from, Walmart and Amazon are two great online stores. 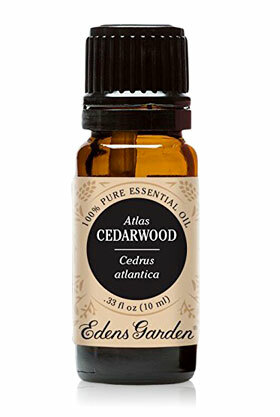 Also, make sure you are buying cedarwood oil made from Cedrus atlantica (also known as atlas cedarwood essential oil), not Juniperus Virginian. Cedrus atlantica is the specific species of cedarwood essential oil used in the above alopecia study. See our cedarwood essential oil recommendations below, which are ALL based on Cedrus atlantica. Top 3: What’s the best cedarwood essential oil for hair growth? 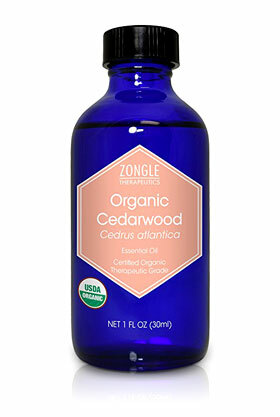 Zongle’s cedarwood oil is 100% pure essential oil with USDA organic certification. The brand goes through a rigorous testing (purity, potency, microbial, and heavy metal tests) to provide the best quality that comes in a high potency form. One reviewer took things a step further and did a paper blotter test in 5 different oils ALL from the same brand. The result? All of those five oils including cedarwood oil showed its purity as an essential oil. Plant Therapy’s cedar essential oil is another option to consider if you are looking for USDA organic certified oils and affordability. This pure essential oil comes in 2 different sizes and the bigger size (30ml) is definitely a better deal price-wise. Edens Garden is a well-known brand in the essential oil industry. They offer affordable equally high-quality essential oils. Their Cedarwood oil is no exception to this. The brand does not use pesticides, gmo or additives in any of their formulas. Edens Garden cedarwood oil also comes in an euro dropper cap (the dripper insert attached to the cap), which makes it convenient for measurement when you are mixing oils for hair growth. Conclusion – Can I use cedarwood oil for hair loss? Cedarwood offers a number of natural properties that are great for hair. Its anti-inflammatory, anti-septic, and antiseborrheic agents make this essential oil a great option for stopping premature hair loss and keeping your scalp healthy by providing just the right amount of natural moisturization. Then, the next question is: Is cedarwood the best oil for hair growth and thickness? If you are going for significant result, use cedarwood oil by mixing with the following essential oils – thyme, rosemary, and lavender oils to get the maximum regrowth benefit. Can you use tea tree oil instead of cedarwood oil? I’m looking for essential oils to get rid of dandruff.